In 12-inch nonstick skillet, melt butter over medium-high heat. Add onion; cook 6 to 8 minutes, stirring frequently, until onions brown; transfer to small bowl. 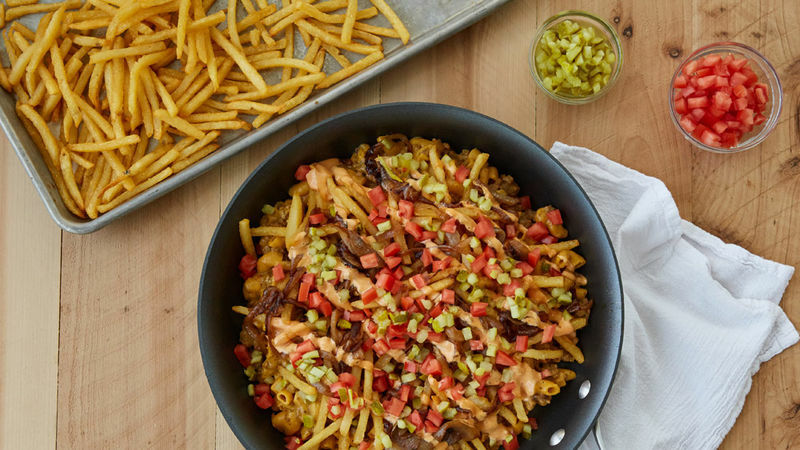 In same skillet, cook beef over medium-high heat 4 to 6 minutes, stirring frequently, until thoroughly cooked; drain. Stir in mustard, milk, hot water, and uncooked pasta and sauce mix (from Hamburger Helper™ box). Heat to boiling, stirring occasionally. Reduce heat; cover and simmer 9 to 11 minutes, stirring occasionally, until pasta is tender. Arrange cooked French fries over mixture in skillet; top with onions. Drizzle with dressing. Sprinkle with tomato and relish. While any frozen French fries will work, thin-cut fries offer a nice crunchy texture that’s delicious with the creamy pasta. Not a fan of Thousand Island dressing? Ranch makes a nice creamy substitute.